Have you had lemongrass before? When mixed with other ingredients it can be really tasty. Lemongrass is associated with Asian cooking especially in Thai, Malaysian and Vietnamese food. Lemongrass is also classified as an herb and is reported to have many health benefits. The herb has antibacterial and antifungal properties. It is very potent in helping to detoxify internal organs, such as the liver, exocrine gland, excretory organs, and the digestive tract. It also helps to lower the buildup of uric acid (herb can bring relief for those who suffer with Gout), cholesterol, superfluous fats and other toxins in the body while helping with digestion, and improving blood circulation. It also has been report for use as calming effect in relieving insomnia and stress. If you can’t find fresh Thai basil, the common sweet basil will work. Lemongrass can be hard to find fresh, so the tube of Garden Gourmet Lemon Grass will work just as well. In a food processor, add coconut, chili, garlic, oil, salt, juice, basil, lemongrass, and process until a paste is formed, about 45 seconds to 1 minute. Set aside. In a large frying pan over medium-high heat, add either 2 tablespoons of coconut oil or avocado oil and heat. Add chopped chicken breast and cook until outside of meat is white or oblique. Add vegetable blend and stir in. Next add lemongrass mixture and stir in. Add 1 tsp. arrowroot starch to ¼ cup of cold water and mix till arrowroot is dissolved, add to meat mixture, mixing in till well incorporated. Continue to stir ingredients till mixture starts to boil and thicken some. Turn heat down to simmer for 10 minutes more or until chicken is cooked through. You can serve over cooked rice. 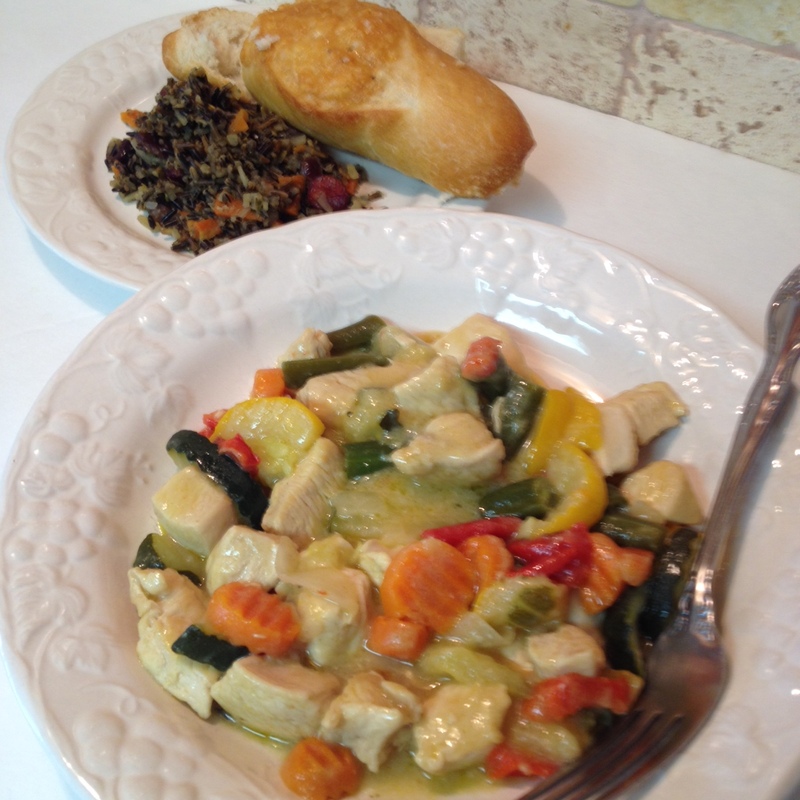 We served our Lemongrass Basil Thai Chicken with a side of Wild Rice with Rosemary, Parsley and Thyme. This entry was posted in Chicken, Main Dish and tagged Aglio e olio, Barbecue chicken, Casserole, Coconut, Cymbopogon, Food, French onion soup, Garlic, Lemon grass, Lemonade, Olive oil, Parmigiano-Reggiano, Rosemary, Sea salt, Tablespoon, Thai, Thai basil, Thai cuisine, Wild Rice. Bookmark the permalink.